CFA has written extensively on the challenges facing the low-volume cardiac surgery program. As demographic, clinical and technological factors coalesce to confront the typical program in today’s hyper-competitive marketplace, it is critical that programs evaluate not only their current operations, but their role in the evolving future. As we have discussed in the past, cardiac surgery programs are more than CABG surgery; they can encompass cardiac valve surgery, combination procedures (e.g., Aortic Valve Replacement [AVR] plus CABG or Mitral Valve Replacement [MVR] + CABG) and the fairly rare cardiac repair such as Atrial Septal Defect (ASD) and Ventricular Septal Defect (VSD) closures in the adult population. It is therefore logical to look at cardiac valve surgery as a growth market to be developed; however, this market is increasingly complex. 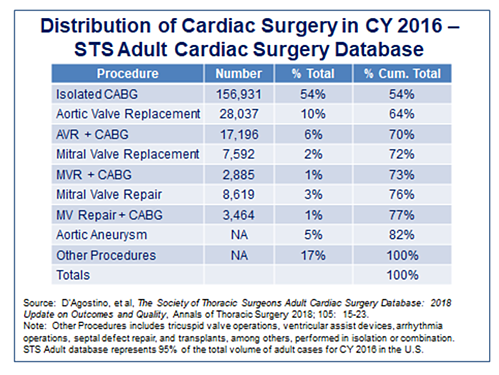 Cardiac valve surgeries in total represented only about 23% of total cardiac surgeries in CY 2016 based on data from the Society of Thoracic Surgeons (STS), and are increasingly subject to new technology, including Transcather AVR (TAVR) and soon Transcatheter MVR (TMVR). Hospital cardiac surgery programs will therefore need to consider both their overall ability to serve valve patients and the potential impact on the volume of total cases represented. Overall cardiac surgery trends are not conducive to low-volume programs – CABG surgery has steadily declined while cardiac valve surgery (with higher prevalence in the aged population) has increased slightly. In select markets, valve surgeries have increased due to the availability of TAVR. Therefore, the average cardiac surgery program has lower overall volumes, with literally hundreds of programs with fewer than 150 total cases and many lower than 100 total cases (please see Can Low Volume Cardiac Surgery Programs be Excellent? and Can Low Volume Cardiac Surgery Programs be Excellent? A 2017 Update). While there are exceptions, low volume programs generally have fewer valve surgeries as referrals tend to go to centers with higher volumes, more technical capabilities and superior outcomes. AVR represents 73% of all cardiac valve surgeries, Surgical AVR (SAVR) now significantly reduced by TAVR – The majority of valve surgeries are aortic valve repairs or replacements, which are steadily converting from open-surgical procedures to TAVR. The Partner and Partner II TAVR trials have proven the procedure viable for both low and intermediate risk patients and the 2008 ACC/AHA Guidelines recommend that TAVR be performed in all symptomatic patients with severe aortic stenosis. Since its introduction in 2011, TAVR volumes have steadily increased at 500 U.S. hospitals. Of note is that the STS/ACC Transcatheter Valve Therapy Registry concludes there is a direct association between TAVR volume and outcome. Therefore, TAVR procedures are increasingly excluded from low-volume programs through vendor initiatives, Medicare regulations, and loss of referrals resulting from sub-par clinical outcomes. While only 7% of all valve surgeries are Mitral Valve surgeries, Surgical MV replacement may ultimately be reduced by TMVR – Mitral valve replacement surgery represents only 3% of the total and is characterized by higher risk, operative mortality, average length of stay and cost-per-case than AVR. Up to 4,000,000 candidates with moderate to severe symptomatic disease are eligible for the APOLLO trial for TMVR that began in late 2017 and will close in 2025. If eventually deemed a successful therapy, this transcatheter approach (albeit for a relatively small total volume) will further erode total valve surgery volumes. Combination/concomitant procedures only 8% and diminishing – A significant percentage of valve patients also have CAD, making combined AVR or MVR with CABG (and/or PCI) an additional part of overall cardiac surgery volume. Concomitant valve/CABG procedure volumes have been impacted by transcatheter procedures as TAVR (and eventually presumably TMVR) are currently considered “stand alone” procedures. Pre-procedural PCI can also be performed on some valve patients. Ultimately, these patients are being excluded from low-volume programs on an increasing basis due to clinical complexity and higher-risk status alone. Surgical competence is critical – While all cardiac surgery requires a skilled surgeon supported by a highly competent team, valve procedures are highly specialized where valve patients are at higher risk than with other procedures. Program volumes/patient referrals and clinical outcomes are highly dependent upon individual surgical skill, mix of procedures, careful patient selection, technology available (e.g., TAVR, TMVR), overall team experience, post-op care and many other factors. Low volume simply does not support this complex mix of critical factors. Consequently, each local situation is unique. Implications for Low-Volume Cardiac Surgery Programs – Each cardiac surgery program is unique and therefore reflective of its hospital and cardiac physician reputation, referral pattern, market area competition and targeted population size and demographics. That being said, the success of any surgical program relies entirely on the combined abilities of its surgeons, appropriate case selection/risk evaluation and the clinical outcomes produced over time. Additionally, general market conditions and reimbursement practices (particularly episode-of-care and quality outcome-based pricing) increasingly disadvantage low-volume providers. CFA was worked with a variety of hospital cardiac surgery programs in a wide set of circumstances. Some programs do virtually no valve surgery; others do a higher proportion of valves than CABGs. Some surgeons do AVR’s but not MVR’s; AVRs and MVRs but not many combination procedures. This all relates, as stated above, directly to the skill of the surgeon(s). Further complicating this situation is the development of evolving non-surgical procedures for AVR and now MVR. When fully realized, both these procedures will seriously reduce the number of traditional surgical valve repairs/replacements in favor of transcatheter-based technologies. Currently, this technology is, and will continue to be, concentrated at higher-volume centers that can also produce higher volumes, superior outcomes and lower cost-per-case/episode than low-volume providers could ever hope to achieve. If you are interested in learning more about low-volume cardiac surgery programs strategies, please download our updated and expanded whitepaper (see Low-Volume Cardiac Surgery Programs: Grow, Consolidate or Divest: Self-Preservation Strategies and Excellence Expectations, our expanded and updated White Paper). If you are interested in cardiac services strategic development, service expansion and/or other programmatic needs for cardiovascular or other services, please contact CFA at (949) 443-4005 or by e-mail at cfa@charlesfrancassociates.com.